NEW: Turn scanned paper documents into instantly editable PDFs with automatic font matching so new edits blend right in. NEW: Edit PDFs faster with full-page paragraph reflow and easy bullet updates. IMPROVED: Export PDFs to Word, Excel, or PowerPoint with improved bullet and table formatting. NEW: Fix suspected text recognition errors in scans faster with a side-by-side view. NEW: Automatically fix document photos to remove backgrounds and adjust perspective. Please note: Adobe Student & Teacher Edition products are for students and educators only. 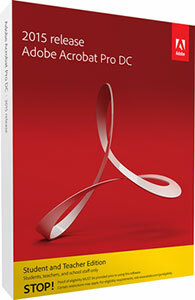 If you (or the person you are buying the product for) are a student or educator, you may use any Adobe Student Edition product; however, Adobe limits use to only one product per student.